You can however play around with the Coded UI tests. A client I recently worked with was able to create CUI test recordings and play them back where Infragistic controls existed. Note this was not using action recordings to create. If your development team is using Infragistic controls please contact Infragistics requesting they add the interfaces to allow MTM to interrogate their controls. Telerik at this time is the only company that has added support for their controls and MTM. 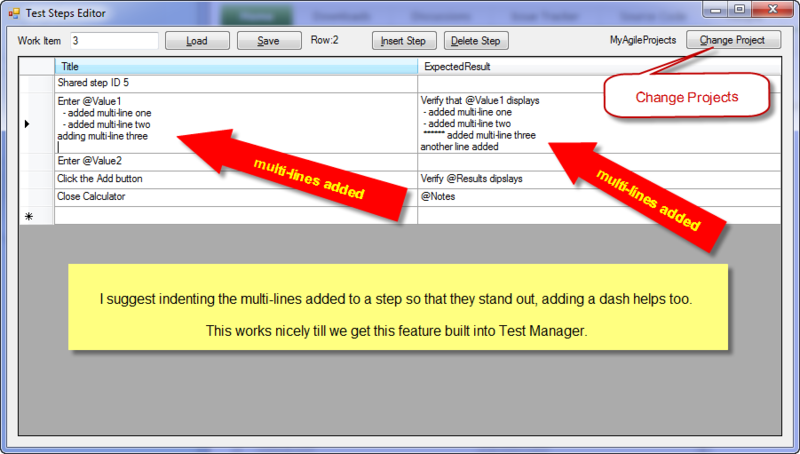 Testers have been asking for multi-step capability in test cases. Shai Raiten has created a tool that enables test case step multi lines. The Test Steps Editor enables editing of actions and expected results to add multi-lines. The tool works with both Shared Steps and Test Cases. 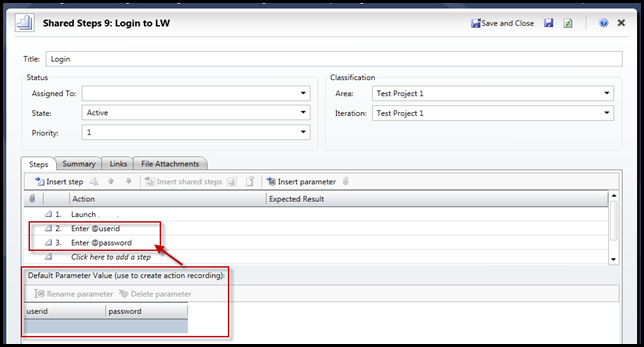 You need to know your work item id, enter then click Load, the test case steps displays. Put your cursor at the end of the line above where you want to add a line. Alt+Enter adds a line below the selected line. Click to download the Test Steps Editor. Shared steps can have parameters however, before adding iterations of data there are considerations you need to take into account. If you consider logically how this works, adding a bunch of parameters and data to a Shared Step will have that step repeat running through the data you added. Then once all iterations of the shared step complete your next test case step would run. Make sense. 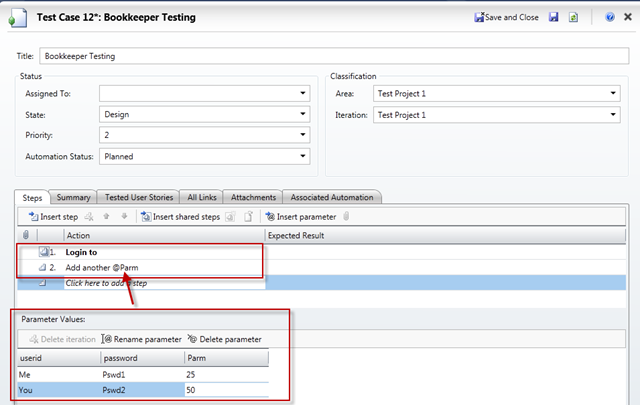 What if I want the Shared Step parameters to run with other parameters in my Test Case? What if I want to add data to my Test Case Shared Step parameters months later? The cleanest and most flexible way I believe and have found is to add data (iterations) to my Shared Step parameters from within the Test Case. Remember a Shared Step can be used in any Test Case and therefore needs to be flexible. A Shared Step with Parameters > no data (iteration) added. I have seen cases where testing always uses the same UserID and Pswd for login. In that case having these as parameters set within a Shared Step makes sense. If a new set of credentials is issued you can easily change them in one place, quick and simple. Note: now this is confusing. 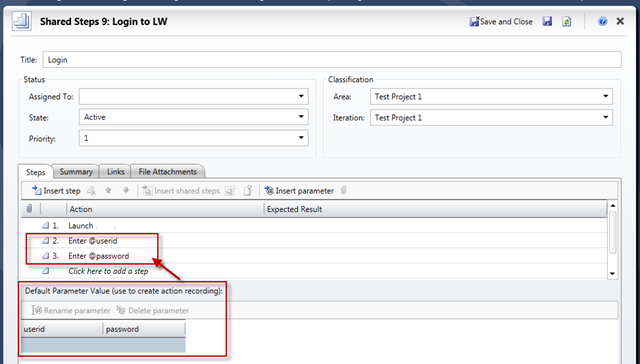 I set my parameters in a Shared Step added the Shared Step to a Test Case. 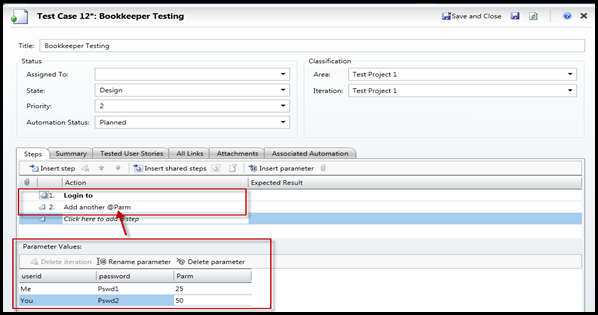 In the Test Case the shared step parameters display however they do not show any data. Comments on this subject are welcome. If you have found a different way to handle a combination of parameters in shared steps and test cases or situations you have come across – lets learn together.